Wood truss building and warehouses are typically older buildings using wood instead of metal to hold up the roof. They often have wood roof decks. We have had many customers in older building especially in the Midwest and Northeast install WareHouseFoil with great success. These buildings don’t have air conditioning, but there is part of the year where people who WORK in them WISH they did. These are regions where it may not be too hot at night, and the building may cool off at night, but by mid afternoon the buildings can be unbearably hot. Installing a radiant barrier will greatly increase the comfort level even on the hottest day. Wood Truss buildings are EASY to install!! 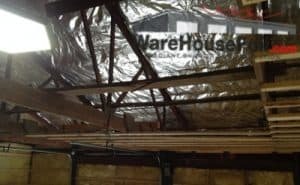 Simply pull WareHouseFoil™ across the bottom of the trusses, and staple it up. For a clean finish look, overlap the seams about 1-2″. Allow air to flow around the perimeter of the foil and through any roof vents. Installing a radiant barrier foil in older buildings with wood trusses is about the easiest install of any building. Remember the roof deck is getting hot and radiating heat across the building. We want to simply break that path and send the radiant heat back. Foil or White Facing Down. What Look Do You Want? The foil side facing the roof will reflect over 97% of radiant heat and to do this you can choose to use either a double sided foil (foil on both sides) or a foil with a white side (one side is foil and the other side is white). Using the foil with a white side gives you two options for the inside of the building. One way will have the foil side facing down, toward the inside of the building and the other way will have a bright white side facing down. 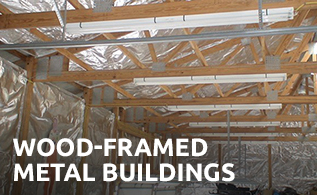 Both options make the interior very bright and increase lighting in the building; however, the option where the foil faces the inside (down toward the inside of building) will be the more effective option for reflecting HEAT back downward in cold weather (i.e. keeping heat inside the building). When installing Radiant Barrier WareHouseFoil™, you are NOT trying to make the installation airtight. In fact, you want air to flow around the the foil and out either the top of the roof or side of the building. The best way to achieve this is to leave a space around the perimeter of the foil as you install it. If you have roof vents, this will allow air to come into the building through overhead doors and windows, go around the foil, pull heat off the hot roof and continue through the roof vents. Good ventilation will help keep the building dry (prevent moisture buildup) and it will keep the air temperature cooler. Plus, on a warm day, a little nice breeze running through your warehouse helps the comfort level even more. 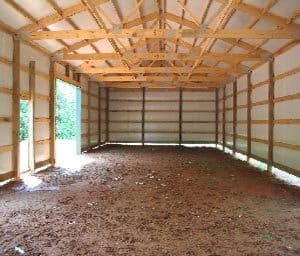 If you aren’t ready to cover your entire building, either because of time and effort or finances, we encourage you to try a small area first. Even tackling a 500 sq ft or 1,000 sq ft area will make a significant impact; you will be amazed at how much cooler the area feels. It’s like the difference between sitting in a car parked in the shade and one in the sun. Eliminate the radiant heat and comfort will follow. 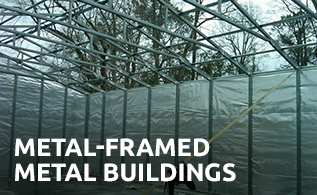 If you need help with your particular building, please call or email us with pictures or video. We have helped thousands of customers and look forward to helping you make your building more comfortable too.